SQL database backup in Windows Azure has become super easy. All you need is a database hosted in Azure and a storage account. You can easily configure backup exports on a daily basis and define how long backups should be accessible. But how to restore such a bacpac backup to you on-prem SQL Server? 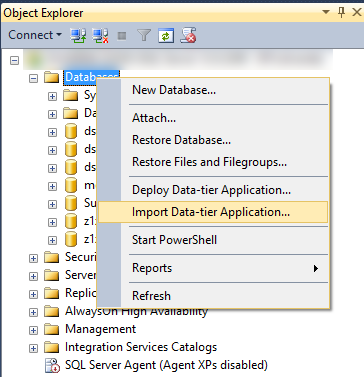 In Object Explorer select Databases from the Object tree. Choose Import Data-tier-Application and point to the *.bacpac file you downloaded from Azure earlier. The wizard is mostly self-explanatory, for instance you can change the database name under which the bacpac package should be restored. Dealing with a failover cluster like a database hosted in SQL Azure implies unfortunately to deal with connection issues, just because one is not connected to a single instance but to a bunch of typically three SQL server instances. Thus connection requests are routed by a load balancer to one or the other instances. The service is currently busy. Retry the request after 10 seconds. The cause of those exceptions, an instance that is not available anymore for instance, is actually pretty reasonable and in fact it is something that one need to have in mind when interacting with a cluster instead of a single server. But how to cope with it? Because I wasn’t the first who was facing this problem I found a pretty good solution based on the Microsoft patterns and practices guide, called Transient Fault Handling. The basic idea of this solution is that there are differences in the exceptions you receive when talking to SQL Azure. Some are transient and though valid to give it another try and some simply aren’t. If you are facing a connection issue you want to try it again for a few times, a few seconds later. A syntax error, somewhere in the SQL query, on the other hand wouldn’t make sense to get tried again. All you need is to install the Transient Fault Handling Core package, if you need only Linq support, or for the Enterprise Library 5.0 Transient Fault Handling Application Block package. Just search for TransientFault in the nuget package manager console. After the reference(s) are added you can implement the ItransientErrorDetectionStrategy interface. Which provides exact one method, named IsTransient. There are different sample implementations on the web, some deal with SqlExcpetion error numbers, some evaluate the exception message text. I don’t prefer parsing the exception text, it seems odd to me, because those messages might be localized. An implementation might look like this. A much more thoroughly implemented version can be found here. Dealing with numbers on the other hand is tricky too, because native SQL server errors are wrapped by the .Net framework and can be provided by different sources. I decided to check the most common error numbers, but log every exception that is checked by the IsTransient method. If the error number was not in my transient exception list, I can still add it later. The execution of a retry aware linq statement is quite easy actually. First you need to define a RetryPolicy based on your RetryStrategy. You’d also add the amount of retries and a timespan when to start the next retry in the constructor. Now, that we have created a policy we can take the actual linq query and wrap it into a retry policy Action. The policy ExcecuteAction method executes consumes the linq statement as a lambda function and executes it, but now retry aware, in other words it wraps an extra try catch block around it. An exception, thrown inside the action will be caught by the retry policy handler and forwarded to the retry detection strategy implementation. If the exception is transient, the action will be executed again until the execution was successful. If the exception wasn’t considered as transient or the retry limit was hit, the original exception is finally thrown. This enterprise application block of Microsoft’s Best Practices team is a pretty straight forward solution, easy to implement and exactly what I was looking for to work reliably with SQL Azure databases. This is caused by a default settings for databases in SQL Express, which closes automatically the database when there was no connection for a period of time. For a development environment having the auto-close setting turned on makes absolutely sense, since it saves CPU an memory. In a production system though, I tend to turn this feature off to increase performance. prints out to current IDENTITY seed value of the table. Resets the IDENTITY seed back to value to 1. An insert into a Table that has references to fields that have a unique index constraint is not supported in Linq-to-Sql and will throw an “Cast is invalid” exception. I have three tables, a Users and a Roles table. Both have a unique key. One has the UserName and the other the RoleName . A new record to the reference table UsersInRoles can only be added if the Username and the RoleName exists. This works fine in SQL Server, but it fails in Linq-To-Sql. Only, if I delete the references in the Linq-to-Sql mapping file it works in Linq-To-Sql as well. Unfortunately that means, that I always have to remove the references by hand, when I recreate the tables from the SQL Server in the mapping diagram. Yesterday I had the problem that a database I tried to attach to the SQL Server was added with Read Only permissions, because the database was read only. There was no permission set in the file system and the ACLs were set correct as well.